New Arrival photos coming! 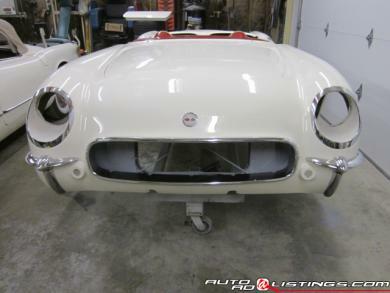 1953 Corvette VIN #067, Polo White with Red interior and Black soft top. This beautiful frame off restoration was done by one of the top restorers of 1953 Corvettes. The car retains its original frame with VIN stamp and VIN tag. It has an early Flint fiberglass body with original front end, the cloth weave shows nicely, and has no rear leaf spring recess relief areas as early 1953 Corvettes should be constructed. All components have been meticulously restored and NOS parts have been used when possible. The engine is matching numbers and has components with correct date codes. Period correct fasteners used throughout. Documentation is back to 1982, car is believed to have been off the road since 1961. This is an opportunity to own a fresh fully restored 1953 Corvette that is ready for NCRS/Bloomington Gold judging.